If there were no need for massive batteries, electric propulsion could dramatically reduce aviation’s contribution to climate change from carbon dioxide emissions. But what if the plane, itself, were the battery? 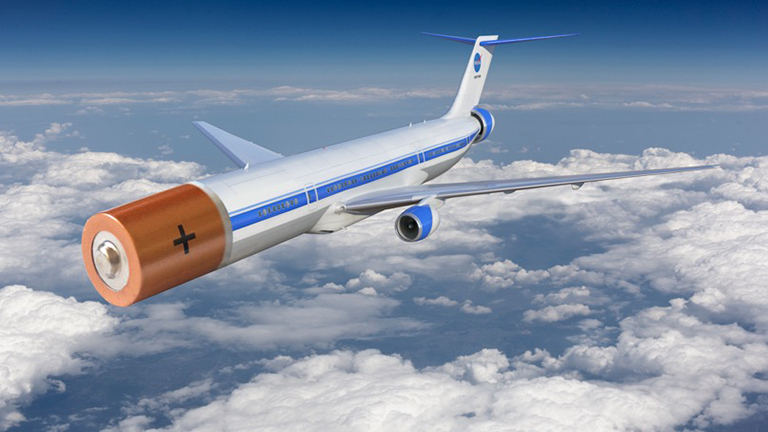 Suppose an aircraft’s skin or floor, for example, could serve double-duty by storing and dispensing electrical energy without adding substantially to the weight of the materials currently used. That could bring us a lot closer to practical electric flight on a meaningful scale. What’s wrong with batteries? For one thing, they’re very heavy. Today’s best batteries would increase a small plane’s weight by about a third. A large plane’s weight would go up by a similar fraction even with highly improved batteries, four times as efficient as today’s best. Lifting all that battery weight eats up a lot of the energy that would be better put toward moving people and cargo. Batteries take up a lot of space, too. And accommodating them, whether inside or outside the plane, increases drag—air resistance that wastes still more energy. The goal of eliminating—or at least reducing—the need for separate batteries drives a team of some 35 scientists and engineers, working at four NASA centers and led by Patricia Loyselle of NASA’s Glenn Research Center in Cleveland, Ohio. Their project, called M-SHELLS (for Multifunctional Structures for High-Energy Lightweight Load-bearing Storage), falls under NASA’s Transformative Aeronautics Concepts Program. TACP supports efforts that have a high risk of failure because of their ultra-challenging nature, but which will pay off big if they succeed. And in this case, the benefits could potentially go far beyond aeronautics. The battery system that powers NASA’s new X-57 Maxwell all-electric aircraft increases the plane’s weight by a third. Using M-SHELLS material to build future planes may reduce that added weight significantly. The team is trying to merge two kinds of energy technology. “We are developing what’s called a hybrid supercapacitor that’s got the qualities of a battery as well as the qualities of a supercapacitor,” Loyselle said, noting that batteries are able to store a lot of energy whereas supercapacitors are speed demons for charging and discharging. Large all-electric planes will require the ability to pack much more energy into a given amount of battery—whether M-SHELLS or the standard kinds—than any developments currently visible on the horizon. So when it comes to commercial transport aircraft, M-SHELLS products in the near term are most likely to be used for hybrid planes that use a combination of electricity and jet fuel much as a Prius uses electricity and gasoline. Part of the electrical advantage goes back to the problem of drag. Air pushes back against objects moving through it, and fighting that resistance wastes energy, whether from electric batteries or jet fuel. Though engineers streamline planes as much as possible, a certain amount of drag is unavoidable. Ironically, standard jet engines are deliberately built to create drag in order to slow down the air rushing into them. They are too large to be positioned where they could take advantage of drag caused by the airplane’s body and, in any case, that airflow is too uneven for jet turbine engines to use efficiently. Adding electricity to the mix also enables designers to solve a problem that afflicts all regular jet aircraft. Jet engines have to be designed for the maximum demand that will be placed on them, which occurs as the plane is taking off and climbing. But the large engines capable of lifting a plane are actually too big for the job of cruising at a constant altitude, which is how an aircraft spends most of its time. And oversized engines don’t operate at peak efficiency, which wastes fuel. Jet-fuel engines could be sized for cruising at maximum efficiency if electric motors were to supplement them at takeoff. That would reduce carbon dioxide emissions as well as contrails, those long, thin clouds that form in the wake of jet engines and may also have a planet-warming effect.